have many long gun carry bags to choose from. Protect your weaponry along with your optics with a case that can endure by choosing Plano's 10489 Gun Guard SE Contour Single Scoped Rifle Case. 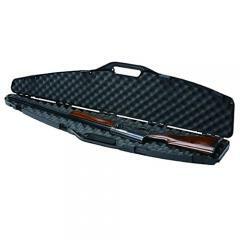 Plano uses a ribbed construction to create the framework for this case, then lines it with foam padding to guard against damage to the firearm when in transit. The SE Contour features recessed handle and latches to add to the durability of the design. Gun Guard also includes padlock tabs to keep your gun safe and secure. Model 10489 will accommodate a single rifle or shotgun with a mounted scope, which can be a standard or high-mount configuration. Dimensions: 52.5" x 11.32" x 3.25"